NASA mission managers are seeking to delay the final twoscheduled space shuttle flights, a move that ? if approved ? would push thelast liftoff of the shuttle era to February 2011, space agency officials haveconfirmed. Under the proposed change, the final scheduled flight of theshuttle Discovery, the STS-133 mission currently slated for a Sept. 16 launch,would slip to Oct. 29. That delay would in turn push the lastplanned shuttle mission, the November flight of Endeavour on the STS-134mission, to Feb. 28, 2011. "The change request will be reviewed by all affectedparties ? the space station program, the astronaut office, missioncontrollers," NASA spokesperson Mike Curie told SPACE.com from theagency's headquarters in Washington, D.C. "It's being discussed but therehas been no decision made yet." A final decision on whether to pushback the flights will be made July 1, he said. "They just need a little bit more time to get some ofthe spare hardware ready to fly on STS-133," Curie said. Discovery's STS-133 mission will deliver spare parts and anItalian room called Leonardo to the International Space Station. Formerly acargo pod, the Leonardo module has been refitted to serve as a permanentstorage room on the space station. The mission will also carry a humanoid robotcalled Robonaut 2 for tests aboard the station. 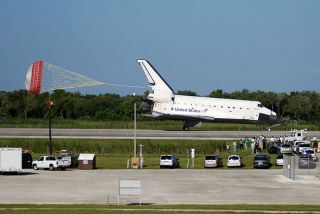 NASA wants to haul as many large parts as possible on thefinal shuttle flights before the three-orbiterfleet is retired. The payload on the final shuttle mission has alsoexperienced some delaysin processing. Endeavour is slated to carry the $1.5 billion Alpha MagneticSpectrometer, an astrophysics experiment, to the station. Scientists decided in April to replace a key magnet on theinstrument with a more permanent one that would allow the experiment to run fora longer time on the orbiting laboratory. The possible push to February for the mission, however,would simply be the result of the shakeup in the penultimate mission'stimeline, Curie said. If Discovery launches in October, November would likelybe too quick a turnaround time to launch the last mission, he added. Then, because of undesirable sun angles for the next fewmonths, the next best time to launch would be in 2011. Several robotic cargoships and a Soyuz vehicle with new station crewmembers are also due at thestation in late 2010 and January 2011, complicating the shuttle launchopportunities, NASA officials have said. "The next really available launch window is in lateFebruary," Curie said.